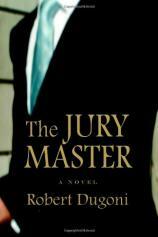 Robert Dugoni established his bona fides well before the publication of THE JURY MASTER, his first full-length novel. He practiced law for almost two decades before leaving the courtroom to write on a full-time basis. His first book publishing credit was as co-author of THE CYANIDE CANARY, a nonfiction work about a wrongful death case that reads like a detective novel. THE JURY MASTER is fiction, but Dugoni's talent for creating true-to-life characters and bringing them to the printed page gives this work the ring of truth. When first we meet David Sloane he is in a San Francisco courtroom, representing a client who would appear to be a sure loser. Sloane demonstrates himself to be at least a magician and at most the jury master when he turns the jury around within a matter of minutes and ultimately exonerates his client who, of course, is a miserable human being. Meanwhile, thousands of miles away, a police officer in West Virginia responds to what sounds like a distress call --- only to subsequently disappear. What is left is the body of Joe Branick, the best friend of the President of the United States and one of his closest advisors. Branick is an apparent suicide victim, but his actions before dying are puzzling, none more so than his repeated telephone calls --- and the mailing of a package --- to Sloane. Sloane doesn't recall ever meeting Branick, but no matter. Sloane's life is soon turned upside down as he finds that he is being pursued by a mysterious and homicidal assailant who will stop at nothing to get information Sloane does not have and documents he has not received from a man he has never met. Tom "Mole" Molia, a rumpled homicide detective, is busily investigating Branick's demise, despite some very insistent instructions from a highly placed Federal government official that he not do so. While his very presence tends to tick off anyone who is within a 50-mile radius, Molia does get the job done. Meanwhile, Charles Jenkins, an ex-CIA operative living a satisfying but reclusive life in Oregon, finds his semi-idyllic existence abruptly shattered as well when he is the target of an attack that, for some reason, seems to be related to Sloane and Branick. Dugoni keeps THE JURY MASTER moving quickly by alternating amongst his various plot threads while bringing the principals ever closer to each other, reaching a conclusion and a relationship that is totally unexpected. Whether he will bring back any of the surviving characters for another go-around remains to be seen. But what THE JURY MASTER demonstrates is that, in one book, Dugoni can create enough memorable characters and action scenes to fill three. You can't ask for much more than that.